The traditional, standard t-shirt is designed with a straight, rectangular cut offering plenty of room for many different sizes and shapes. This squarish fit looks good on rectangular or triangular-shaped bodies, but not as much on those with narrow shoulders, round abdomens or other areas that cause pulls or gaps in the fabric. A slim-fit shirt is narrower than the standard box cut, making it a good choice for the naturally thin or those preferring a shirt that clings to the body. The slimmer style might also mean the neck band and hem is thinner than the traditional cut. Another option is the raglan t-shirt -- sometimes called a "baseball shirt" -- with diagonally cut arms and a neck band attached to the sleeves. Some find the raglan more flattering than standard fit because the slanted seams below the shoulders can slim a bulky torso. Raglans usually have three-quarter length sleeves and a crew neckline in a contrasting colour to the front and back of the shirt. Standard, slim and raglan are the most common cuts, but look in boutiques and online manufacturers for alternatives such as crop tops or slouchy styles. There are many t-shirt styles designed especially for women -- you'll find petite, plus and slim shirts with curvy cuts instead of straight. Both sexes (and those between) can also buy loose or relaxed fit shirts that maintain the straight cut but have more width. Soft, durable fabric with the right amount of stretch is what favourite clothes are made of, and fibre composition should be an important factor to consider when shopping online or in stores for new t-shirts. But what should you look for on the label, exactly? Most tees are made from cotton, but the amount and quality of cotton will vary depending on the manufacturer's choices. A 100-percent cotton shirt could be stiff and have a higher shrink percentage compared to one composed of cotton and a secondary fibre. For a super-stretchy shirt, look for synthetics on the label, such as familiar names like polyester, spandex, lycra, nylon and acrylic. The ratio between cotton and polyester affects not only the degree of stretch, but also its durability. If you like to toss your t-shirts in the dryer, the synthetic composition will help you do that as much as you like. Manmade fibres also prevent wrinkles, so you won't have to iron your tee to keep it looking smooth. Synthetics aren't the only complements to cotton. 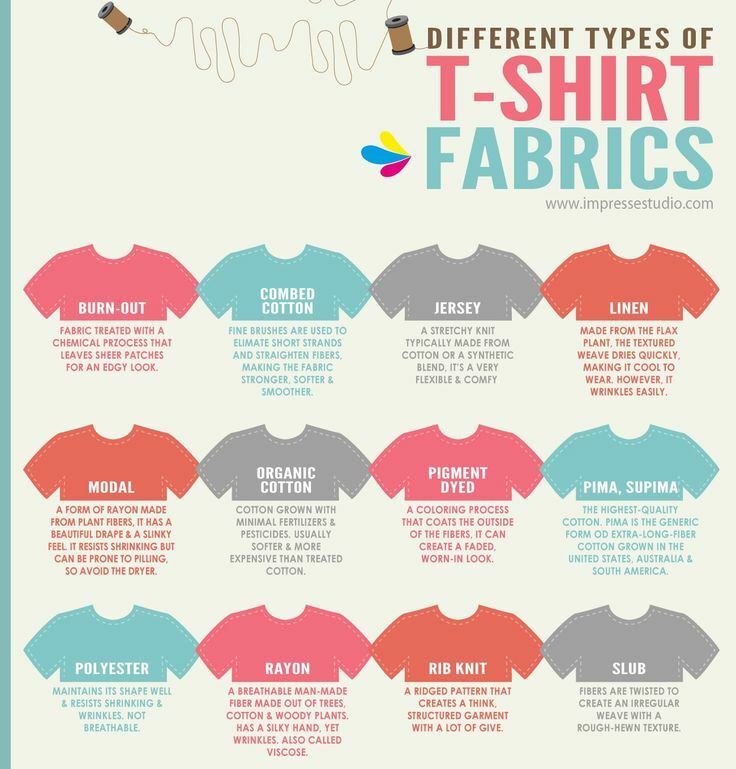 A commonly found combination of cotton, polyester and rayon, or "tri-blend," is popular due to level of comfort, durability and what's known as "drape," or the way a fabric moves and falls on the body. Rayon, a man-made fibre made from cellulose, is especially good at providing drape and the silkiness that feels so good against your skin. Note that tri-blends might require special care such as air-drying or even dry cleaning, so check the label before you buy. Besides rayon, you might also find t-shirts -- usually more expensive than average -- made with hemp, bamboo, linen, silk and recycled fibres. Fibre composition also affects the weight of the shirt. If you prefer light shirts, avoid the label "heavyweight." And even though natural fibres can make a shirt feel heavy, they usually provide more breathability than synthetics, keeping you cool and dry in hot weather. 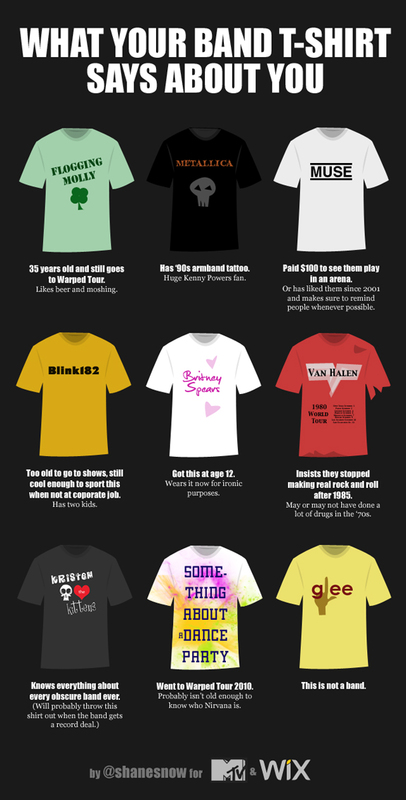 Your favourite t-shirt fits great and feels comfortable, but what about its style? The neckline and sleeves play an important part of the overall picture of you walking down the street. If your t-shirt collection is ample, you might already have a favourite neckline. Perhaps it's the classic crew that circles your next or a V-neck that provides a little plunge. Some dismiss both in favour of a flattering scoop neckline or the trendy ripped-up neck that's a favourite among dancers. The sleeve style you choose might depend on the time of year, your love or dislike of layering or a desire to display or hide body ink (or arm fat). While the traditional t-shirt is short sleeved, the long-sleeve version is good-looking and suitable for winter sports and morning runs. Raglan sleeves keep your upper arms covered in air-conditioning and provide a nice swing to your step. The dolman sleeve, also called "bat wing," takes a t-shirt up a step in sophistication. Those who like to go sleeveless can choose tanks or what's known as a muscle shirt, a standard cut t-shirt with sleeves subtracted. Tees come in all colours. The best sellers are usually black, navy blue, grey or white, but technological advancement in colour safe dyes has delivered shades of pink, purple, brown, red, green, yellow and rainbow blends. For variety, you might buy a speckled or heathered shirt; one with contrasting neck bands, sleeves and pockets; or an ombre fade or camouflage print. In many ways, t-shirts are a canvas for cultural expression. Yuniya Kawamura, author of the book Fashion-ology, says that "for consumers in postmodern societies, anything and everything can be fashion," and that includes t-shirts, of course. The designs, motifs, illustrations, patches and typography you wear says even more than the style, fabric and colour. There's no doubt your t-shirt speaks to who you are and where you're going in the world, so choose it well.